Fruit and vegetables, fish and poultry, beef and convenience products – Bremerhaven is one of the most important European ports for handling temperature-controlled food, whether chilled or frozen. Like many other countries in Europe, Germany is highly dependent on imports for its fruit and vegetables and for the supply of fish and seafood. The frozen cargoes arrive in containers from Asia, the USA, Latin America, New Zealand, Russia and Africa and refer primarily to raw materials for the food industry and finished products for the retail trade. With a commercial volume of around 650,000 cubic metres of frozen goods, Bremerhaven is regarded as the largest cold store in Europe. Located in the immediate vicinity of the Fruit and Container Terminal, the BLG Coldstore, part of the BLG Logistics Group, has a current storage capacity of almost 30,000 pallets of chilled and frozen goods. From handling right through to storage and distribution, the BLG Coldstore offers a full range of services for the import and export of chilled and frozen products. With two Fruit Terminals at Kaiserhafen and Columbuskaje, Bremerhaven is involved in the distribution of fresh fruit and vegetables to destinations throughout Germany and other European countries. The product variety ranges from new potatoes from Egypt to apples and pears from South Africa. In 2016, 270,000 tons of fruit, including large quantities of bananas from South and Central America, were imported from overseas via Bremerhaven. Constant temperature control throughout the entire transport and storage is essential to ensure that the fruit reaches the shops in the condition demanded by the customers. Bananas, for example, are picked while still green and undergo a precisely planned ripening process on their way to the shops. 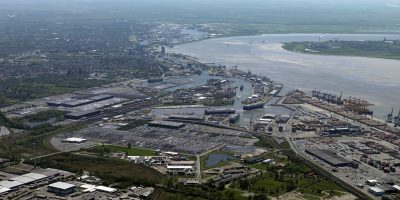 The Fischereihafen in Bremerhaven currently employs around 3500 people in the fish and food industries and the suppliers and service providers for these industries. The first 50,000 bunches of bananas were discharged in Bremerhaven on 3 July 1925. You want to get more information about the ports in Bremerhaven?